Swansea City head coach Garry Monk welcomed the 2-1 win over Newcastle at St James' Park that edged them closer to Premier League survival. But he believes they have played better this season and earned nothing for it. 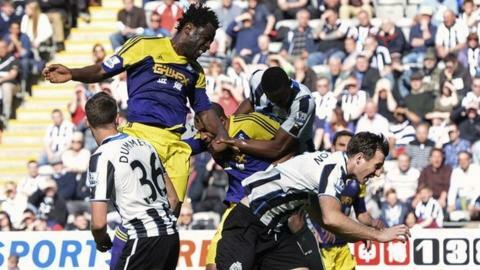 Newcastle's Shola Ameobi struck first, but Wilfried Bony scored at the end of each half to give the Swans victory. "We've played a lot better than we did today and come away with nothing and so it was pleasing," said Monk. "And whichever way, whatever time of the season it is, it's whatever it takes to get the job done and we managed to do that today [Saturday], which was great." Ameobi's stylish opener came against the run of play. Bony headed in from Ben Davies' corner and after substitute Marvin Emnes was brought down in the penalty area, the Ivory Coast international calmly hit the top right of the net from the penalty spot for the winner. Monk added: "We started well, first 20 minutes, and then they got the goal, obviously, and we got a little bit sloppy in our passing. "But second half we came out there and I just said if we upped our intensity a little bit you're always going to have a chance in the game. "And I don't care how late it comes, as long as it comes - and it was a penalty, a stonewall penalty - so it was good to get those rewards." The win took Swansea to 13th in the table, but they remain six points above the relegation zone with three games left, at home against Aston Villa and Southampton, followed by a final day trip to Sunderland on Sunday, 11 May. Monk took charge of Swansea in February following the sacking of Michael Laudrup as manager and the win at Newcastle is only his third in 11 Premier League matches as Swans boss. "It's been a very difficult season for ourselves, very inconsistent for our standards that we've set over recent seasons," said Monk. "So we're just trying to get the job done and this three points goes a long way to doing that. "Of course I knew it was going to be difficult coming into this and everyone will talk about the experience of myself and stuff like that. "But this is a club that I've been at for 10 years and whenever they ask me to do something I always do it for them." "Today's for the fans for us. I know every manager would say that, but I really do mean it."